: 444 р. 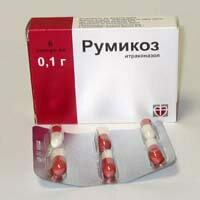 Average online price * : 444 r.
Candidiasis, including candidiasis of the skin, nails, vaginal, oral cavity, etc. 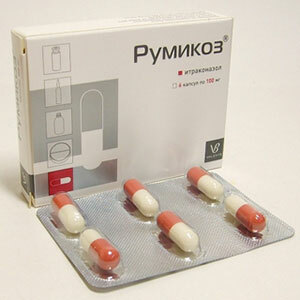 As with any pill, Rumicosis is prescribed in the case of the running form of nail fungus . For nail fungus, apply a 3 week course with breaks of 3 weeks. Naturally, you should also use a local drug (drops or ointment). Treatment with a local drug lasts until the regrowth of a healthy nail. It is necessary to accept Rumikoz only according to the order of the doctor and under his control. 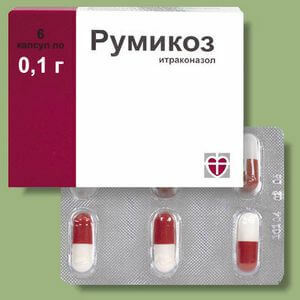 Rumikoz is contraindicated in pregnancy and breastfeeding. In case of emergency, the appointment of a nursing mother, you need to decide on the timing of the termination of breastfeeding. 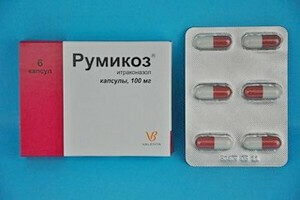 You should also use contraceptives and do not plan for conception during the period of treatment with Rumicoz. extremely rare: erythema multiforme exudative (Stevens-Johnson syndrome), alopecia, photosensitivity of the skin. staining of urine in a dark color. Antimycotic of a wide range of antifungal action, a group of triazoles. Ingredients: Itraconazole (100 mg), hypromellose, gelatin, dyes, starch, poloxamer, sugar. Like many other antifungal drugs, inhibits the synthesis of ergosterol, which is the main building material for the cell membrane of pathogenic fungi. Thereby stops the growth of the fungus and leads to its death. Store in a dark, dry, out of reach of children, at a temperature not exceeding 25 ° C. Shelf life is 3 years. For sale by prescription.